Oh, I'm sorry baby, the children's museum is closed today. We can't watch Daniel Tiger because he had to take a nap (alternately I use, go night-night, go to the potty...basically insert whatever activity I'm attempting to coerce my child into). No, mommy isn't eating candy, it's grown-up medicine. I've also been known to tell my son that the crispy layers of oven-roasted brussels sprouts are "chips" and that roasted red potatoes are "french fries". It's not ill-meant, but sometimes that little lie saves the day. I recently read some epic fibs that other parents have told their kiddos that I'm saving for the future. My favorite? Chuck E. Cheese is only for birthday parties and we haven't been invited to one today. BRILLIANT. Parenting win. 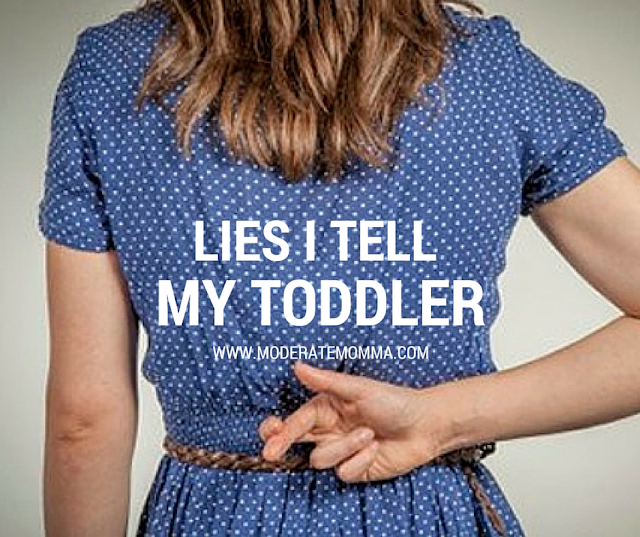 So, what lies have you told your littles?